Near Gatton, 93 km to Brisbane CDB, 40 km to Toowoomba. Registered breeders of pedigree Siamese and Oriental cats. For information about Stud and Kitten availability, Please contact us. 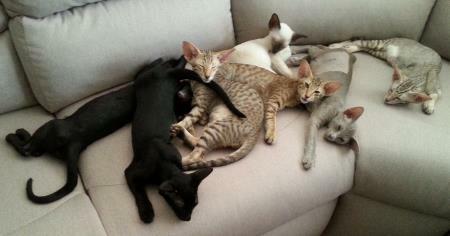 Our cattery includes a range of colours in Siamese, Oriental and Spotted Oriental. Kittens are chosen for Temperament first and then colour and type. You are welcome to come and view the kittens once they are weaned. We ask that if you would like to purchase one that you give us a deposit.